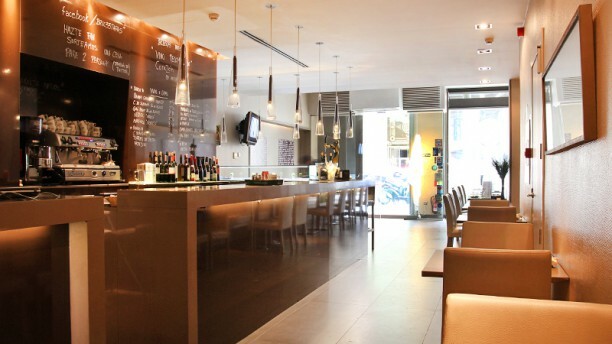 "A few minutes from the Plaça Urquinaona in Barcelona, we find this pleasant tapas place: Bruc 33. Decorated in a simple and modern style, it has a striking bar that invites us to enjoy the food and spend time away from the stress of everyday life. Its Mediterranean cuisine offers a great variety of dishes, including grilled beach squid, the duo of grilled hamburgers and chicken strips with spicy sauce. If your idea is to experience and enjoy a relaxed and casual atmosphere, Bruc 33 is the place you were looking for." Las reservas a través del tenedor.es, no son compatibles con ofertas o promociones de otros portales o empresas. Servicio excelente y local acogedor. Recomendable. Location carina ma Cibo di bassa qualità. Edible. But nothing was delicious. A bit salty. Good if convienient. with the discount from the app it has good value for money. Service was good. Va ser una agradable descoberta des de fa un any. Per repetir sempre. Tapas ricas en un ambiente agradable! Great food with a very clean quiet relaxing ambience. The food was delicious and the service was excellent. The waiter was professional and kind. We can’t wait to come back again! Service was quite slow. The tapas we order were half good, half average. At the end the price was ok with the discount, otherwise it would be a disappointment. Food is good, portions are not very big. Nice atmosphere and good service. It was a Bit cold inside the restaurant but the food was superb!